1. Big news. I got endorsed for my NCLEX, which told me I was allowed to schedule my test date. When I saw the official email I wanted to throw up I was so happy and nervous. So because I'm a complete spaz, I have schedule and rescheduled the test. First, I scheduled it for February 14, and then I realized that I didn't want to wait that long and prolong the inevitable (passing of course ;)) So I rescheduled for January 28. I'm so ready to stop thinking about this test and never think about it again. 2. So I recently signed up for Ipsy. If you don't know what Ipsy is, it's a whole lot like Birchbox or those other boxes you sign up for and get a monthly box of goodies for $10. Ipsy gives you makeup and all kinds of skin care items each month. They let you fill out a quiz and you tell them what kind of skin you have, as well as your features and style of makeup you like. They supposedly only give you things that you like. I'll do a full review for you after I get my first bag. I can't wait! 3. 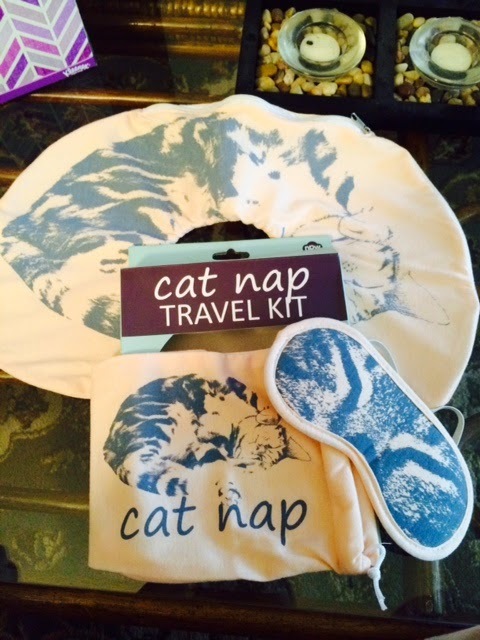 Cat Nap travel kit. I'm sure glad I have friends that love me enough to buy things like this, and support my cat lady aspirations in life. The back is an inflatable neck pillow, a cat eye mask and a little sack to carry all of it in. I'm pretty sure she got here and it's fabulous! We are Cali bound next week! Wish us luck house hunting!